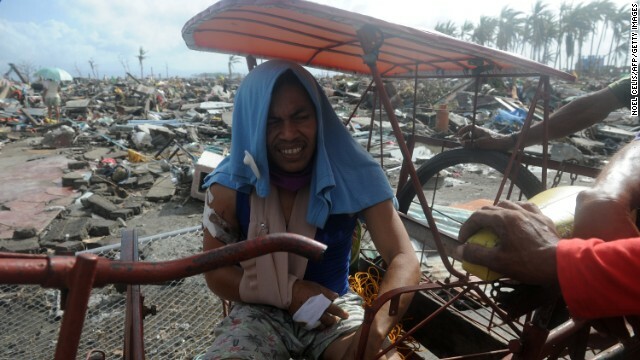 A flood survivor is surrounded by debris on the Philippine island of Leyte. Where was God in the Philippines? (CNN) - The disasters are always different and often devastating. But the questions they raise are hauntingly familiar. In the days since Super Typhoon Haiyan swept through the Philippines on Thursday, survivors are frantically searching for lost family members and international aid groups are springing into action. Officials say the death toll may rise to 10,000 in the heavily Catholic country. Meanwhile, many people are asking: How should we make sense of such senseless death and destruction? Was God in the whirlwind itself, as the Bible hints, or present only in the aftermath, as people mobilize to provide food, water and shelter? These questions may not be new, but we keep asking them, perhaps because the answers remain so elusive. For many Americans, a paradox sits at the heart of their thinking about natural disasters. According to a survey taken after 2011's earthquake and tsunami in Japan, most Americans (56%) believe that God is control of everything. But more Americans blame hurricanes, earthquakes and other storms on global warming (58%) than on an angry and punishing deity (38%), according to a 2011 poll by the Public Religion Research Institute. “These kind of questions about God being in control and there simultaneously being suffering are the kind of things that keep seminarians up at night," institute CEO Robert P. Jones said in 2011. The Bible's Psalm 107 says that “For (God) commands, and raises the stormy wind, which lifts up the waves thereof. ... He turns rivers into a wilderness, and the water springs into dry ground." But, as the poll shows, most Americans have moved past the idea that God causes natural disasters, wrote Stephen Prothero, a frequent CNN contributor, in a 2011 column. "When it comes to earthquakes and hurricanes, our authorities are geologists and meteorologists," Prothero said as he rode out Hurricane Irene on Cape Cod in Massachusetts. "Most of us interpret these events not through the rumblings of the biblical prophet Jeremiah or the poetry of the Book of Revelation but through the scientific truths of air pressure and tectonic plates." For atheists, storms like Haiyan are proof that God doesn't exist, author and activist Sam Harris said. "Either God can do nothing to stop catastrophes like this, or he doesn’t care to, or he doesn’t exist. God is either impotent, evil or imaginary," Harris said after Japan's tsunami. "Take your pick, and choose wisely." God may or may not be in withering storms, but many religious leaders say they sense a divine presence in the aftermath, as people across the world mobilize to lend a hand. Rabbi Harold Kushner is one of the most famous names in the realm of theodicy, a branch of theology that tries to explain the unexplainable: why a good God would allow bad things to happen. After Japan's tsunami, Kushner called nature "an equal-opportunity destroyer," making no distinctions between sinners and saints. But Kushner, author of the bestselling book "When Bad Things Happen to Good People," said he sees God's hand in the resilience of people whose lives have been destroyed and in the "goodness and generosity" of strangers who donate and pray for the survivors. That still leaves a tricky question, though: Why do humans suffer, sometimes terribly, in the first place? There's no good answer, says the Rev. James Martin, a Jesuit priest and best-selling author. "Each person has to come to grips with that," Martin said. "It’s not as if some magic answer can be found. But the idea of God suffering along with us can be very helpful." Muslims, on the other hand, see stormy trials as tests from God, said Sayyid Syeed, national director of the Islamic Society of North America’s Office of Interfaith and Community Alliances. "Muslims believe that God tests those he loves, and these tragedies also serve as a reminder to the rest of us to remain grateful to God for all our blessings and cognizant that we must support those in need," Syeed said. Vietnamese Buddhist master Thich Nhat Hanh, whose native country remains in Haiyan's path, said such storms remind us that our lives are impermanent and the importance of treasuring each moment. "This is the best that we can do for those who have died: We can live in such a way that they can feel they are continuing to live in us, more mindfully, more profoundly, more beautifully, tasting every minute of life available to us, for them," Hanh said. Stephen Prothero, Jessica Ravitz and Eric Marrapodi contributed to this report. Next entry »Pope Francis won the Internet. Literally. Reblogged this on Thoughts Potato. Where was God in the Philippines? What a stooopid question? You mean God will watch Pilipinos HAARPed by Al Gore. Just few weeks before Typhoon Haiyan swept through the Philippines. This heavily Catholic country hit the streets shooting anything moves hoping it’s a Muslim. Where was God in the Philippines then? He was very much their inspiring Al Gore to HAARP the hell outta ‘em. It is astonishing that internet atheists are unable to see (or admit) that Christians can and do love mutual inquiry, ‘real’ science, ordinary science, and evidence. Both Christians and atheists use the same rational methods of pursuing truth. The difference is in their conclusions, not their methodology. This is where you are full of it......you need to apply mutual inquiry, ‘real’ science, ordinary science, and evidence in what you are suggesting is the answer to all life and creation. You have not applied these methods to your book...it's historical components and the political relationships of those times when it was formulated. So if I understand you, Christians love real science and methodologies but draw different conclusions than Atheists. I think I have to agree with you. For example, science tells us that humans evolved from a common ancestor. Science also tells us that Sodom and Gomorrah did burn in volcanic ash. Us Atheists see a path from primates to humans; We also know about volcanoes and being in the wrong place at the wrong time. However, Christians want to believe that an ageless, mean, yet loving, invisible, spirit ghost thingy in the sky dealt us these experiences. I would say our conclusions are far apart. You are correct sir. Liar. You'll burn in hell. My son wrote a letter concerning this article as an assignment by his teacher to write a persuasive essay for class. He wanted to share it. When that catastrophe happened in the Philippines, many people were hurt. Children lost their parents, husbands lost their wives, cities were destroyed, etc. However, although this is a sad tragic event, I am opposed to your article, ”Where Was God In The Philippines.“ In my opinion, this article blames God. People always want to blame God when something bad happens. Yet when life is good, nobody even thinks about God or studying his word to understand the why’s of life. God is not the blame for worldwide tragedies or disasters. Man can only blame himself, and God lets us know this in his word. The wages of sin is death, but the free gift of God is eternal life in Jesus Christ our lord, Romans 6:23. Whenever there is injustice and evil, you will see destruction. Many people don’t realize that the Philippines suffer from widespread corruption in government such as graft, bribery, embezzlement, backdoor deals, nepotism, and patronage. In fact, according to World Bank, corruption in the Philippines is considered to be the worst among East Asia’s leading economies. Although many people don’t realize that there are consequences for their actions, the bible says, “for the one who sows to his own flesh will from the flesh reap corruption.” Therefore you can’t do wrong in the world and not expect there not to be repercussions. If people studied the bible they would know that prophesy reveals these things will take place due to the sin of man, and to make way for the coming of Jesus. Mark 13:7:9 says: “And when you hear of wars and rumors of wars do not be alarmed; this must take place, but the end is not yet, for nation will rise against nation and kingdom against kingdom. There will be earthquakes in various places; there will be famines. These are but the beginning of birth pains.” We are in the end times. Thus, calamities will happen due to the sin of man. This is the reason for the 2nd coming of Jesus. We can’t blame God. Did you realize that it rains on the just and the unjust alike? This is spoken in Mathew 5:45. Trials are going to happen to everybody. However, through prayer, much devastation can be avoided. Even through a Typhoon, lives could be saved through consistent prayer. The word lets us know, “confess your sins to one another and pray for one another that you may be healed, for the prayer of a righteous person has great power as it is working.” Prayer changes things. Prayer can save someone’s life and even a country. How many people actually pray without ceasing as Paul the apostle tells us to do in the bible. You can not wait until a catastrophe happens before you pray. We should be praying and asking God for protection every day. God does not take pleasure in people’s pain and suffering. Yet he will allow things to happen if you do not have a relationship with him. God tells us in his word, “Behold, I stand at the door and knock. If anyone hears my voice and opens the door, I will come in to him and eat with him, and he with me.’’ God loves us so much. All he wants us to do is love him and spend time with him. Most of the world has forgotten about God; and just because people say they are Christians, it does not mean that they have a true relationship with God. This must be established in our personal time. You must pray and read his word daily. You must also obey him. The word of God says, “Whoever has my commandments and keeps them, it is he who loves me. And he who loves me will be loved by my Father, and I will love him and manifest myself to him.” The thing about man is that he tries to pimp God. People only want God when they hit hard times, or when something bad happens. However, if you are in a relationship with a person, you will spend time with them, call them daily, and want to please them, etc. Think about how a child feels about his or her parents, or how a husband feels about his wife. A relationship with God is just like that. Totally delusional as most creationists are. It was a NATURAL disaster.....meaning these types of activities are caused by natural climatic conditions. P.S. jesus is a nice story but that's all it is...a story. No REAL evidence he ever existed. There were many people named jesus at that time and none who were the SON of god. There are however many previous stories of messiah's who were raised rom the dead and actually said they were the way the truth and the life....FACTS!.....do some rsearch...the bible is not research FYI. I'm kind of proud of myself for getting through all that white noise. Sad, another child brainwashed by religion. Sadder still that he has parents who are proud of this nonsense. Much sadder, his parents get to vote. They will probably pray for me and people like me after they read this. Yours is a non-advanced concept. The belief that﻿ a cosmic Jewish Zombie who was his own father can make you live forever if you﻿ symbolically eat his flesh and telepathically tell him you accept him as your master, so he can remove an evil force from your soul that is present in humanity because a devious rib-woman was convinced by a talking snake to eat from a magical tree. Here I have to agree with you. I did that with my first wife. Took her to the desert...and that was that. Just following the good ol' bible. Yes...the major scorning that has gone on for centuries has come from within the bible and it's beliefs. You people 'revel' in the idea and thought that your book is somehow "wise". There are some wise sayings in the bible but most of them are not. I think the idea that "knowledge" is somehow better than real "wisdom" is a folly the bible teaches. The bible in this regard is actually talking about itself and it's followers. "I hope those people who believes in this evil God, suffer and die like those people in the Philippines." Why would you wish suffering on anyone? God was there in the Philippines. Haven't any of you read the bible. When god gets mad at a society he causes great destruction. He did this to the villagers surrounding Noah's Ark. He did this to Sodom and Gomorrah. He also turned Lot's wife into a pillar of salt that same day .. kind of two for one deal, I guess. God was definitely there in the Philippines. What we should be asking is why is he so mad at that country ? Re-read the bible. Now I have to agree with it. My neighbor had this little squiggly thing hanging around his neck and was talking the nonsense of the great satan. So I took him to the desert and cut off his head, just like the bible said. Oh, more on the story of Lot-"One day the older daughter said to the younger, 'Our father is old, and there is no man around here to lie with us, as is the custom all over the earth. Let's get our father to drink wine and then lie with him and preserve our family line through our father.'" - Genesis 19:31-38 (NIV). Guess that didn't bother god. As far as your question, haven't any of you read the bible?" It is very likely a fact that atheists generally read it without skipping over the really hard to read parts without throwing it against the wall. Not the fairy tale parts with the gruesome, immoral, and decadent parts left out but the whole thing. Or at least whole parts from the whole thing. You should really read the story of Lot to see the indecency of the man and the fluctuating attention god pays to his rather scurrilous uses of Lot's daughters. For further reading I suggest you Irreverent mike's biblical indecency, to get a more rounded view of this bible thing. "When you go to war against your enemies and the Lord your God delivers them into your hands and you take captives, if you notice among the captives a beautiful woman and are attracted to her, you may take her as your wife. Bring her into your home and have her shave her head, trim her nails and put aside the clothes she was wearing when captured. After she has lived in your house and mourned her father and mother for a full month, then you may go to her and be her husband and she shall be your wife. If you are not pleased with her, let her go wherever she wishes. You must not sell her or treat her as a slave, since you have dishonored her." even before you were born or millons of years ago the geographic location of the Phillipines is already the breeding grounds of typhoon,God gave us this because we "the poor shall inherit the earth".although really poor ,according to the latest survey by the U.S. we are the no. 1 theist country in the world,94 percent,followed by Chile and the U.S.
we shall be the center of religious faith in the future. God was in Haiti that day....fools! Here's important Prophecy about THE ILLUMINATION OF CONSCIENCE predicted by Virgin Mary in Garabandal in 1961. It will take place soon to save the world. People will believe it to be catastrophic worse than an earthquake But it is not – it is a sign that Jesus has come. The sky will turn red it will look like a fire & then you will see a large cross in the sky to prepare you first. Our sins will be shown to us and this will make us feel tremendous sorrow and shame when they are revealed to us. Others will be so sickened and shocked by the way in which their sins will be revealed that they will drop dead before they have a chance to ask for forgiveness. Everyone will see the state of their soul before God – the good they have done in their lives, the grief they have inflicted on others and all that which they failed to do. Many people will fall down and cry tears of relief. Tears of joy and happiness. Tears of wonder and love. We'll throw that on the pile with all the other failed "prophecies". So this was written in 1961 and it hasn't come true yet. Is there a specific time? If there isn't why not? Jesus asks us to pray for those who might die from shock???? Why would he do this? If he knows who is going to die from shock why doesn't he just not allow them to die from shock and give them an even playing board like the ones who won't die from shock. It would'nt matter would it? This would be great if it were true...but...after hearing of hundreds of other failed 'jesus" prohecies...I am not convinced this is even a prophecy. It is a MANIPULATION and nothing more. All church leaders should either demonstrate the existence of their god or be jailed for fraud. God gave man a free will.!!! Only children and animals don't have a voice or choice. People live where they want, do what they please, not thinking of consequences. I am not perfect either, but I realize the choices I make affects those close to me, so let's not be selfish, be kind to those w.no voice. medve, we do indeed seem to possess "free will"–although how much is debatable, since one can argue that our "will" is merely effects with preceding causes. However, I do think we have some level of free will (agency). However, I would argue that if an all-knowing, all-powerful god actually exists, then we cannot possibly have free will. If God's will is absolute, that means he has all of it. He is claimed to intervene in this world and our lives, unlike a Deistic "First Cause" sort of God. If he is all-knowing and all-powerful, than anything–ANYTHING that happens at all, even every little thought we have, is by his acquiescence, and he can veto or change any thought or action we might make. That is NOT free will. Furthermore, if he is all-knowing, that means he knows the future. In which case, the future is already predetermined, and therefore all of our thoughts and actions are predetermined. No free will. Furthermore still–it is claimed by Christians that this God stands ready to convict us of thought crimes. The worst: doubting his invisible existence, and that he will condemn us to eternal damnation to burn in Hell. The worst threat ever. It is also often claimed that thinking the sin is as bad as the sin itself. There are specific commandments, which (unless we become believers), this God stands ready to convict us of–even in the thought form, and burn us in Hell forever and ever. This is not free will. This is force and extreme duress. If I believed in this all-powerful, all-knowing God, and Hell, I would be terrified. Such a god, who is so capricious that he would burn his own children forever just for doubting his existence is a sadistic monster, and an existence for all eternity by this being's side would be as bad as Hell–eternity knowing that sooner or later, this being's whim could torture you any which way it imagines. Fortunately it's clear to me that it is a myth, designed to control people. for anyone to believe in such a distasteful god. Why would anyone want to spend eternity with such a monster. Critics claim that since Jesus did not say he who is not baptized will be condemned; therefore water baptism is not essential to be saved. If a heart surgeon told you that if you have a heart transplant you will live; he would not have to explain to you that if you refuse the heart transplant you will die. Negatives are understood. If the electric power company informs you if you pay your bill the power will be turned back on; you do not have to be informed that if you do not pay your overdue bill the power will not be restored. Negatives are understood. The apostle Peter did not have to say unless you repent and are baptized your sins will not be forgiven. Negatives are understood. If "He who believes and is baptized will be saved; but he who does not believe will be condemned." is valid, then what about the "Good tidings of great joy FOR ALL PEOPLE" that the Angel of the Lord heralded on the night of Christ's birth? What about Paul writing that "God was in Christ, reconciling the world unto Himself"? You are doing nothing but limiting the scope of what God had intended as a global and eternal act of Salvation. That would be a triple negative, so much like my response to your invitation to visit your website, no, no, no. Since there is no evidence of god, hell, or heaven there is really nothing to disprove. An attempt is not necessary. I c. U want others to prove u r wrong? Sorry. It doesn't work that way. You made the claim. Now go ahead and prove it. Since u cannot, it is false.